Yes, I am a child of the 80's. And while the hairdo's stunk, the fashion was atrocious, and the music banned by my father, at least there was some good television! And I have to admit, I always feel a bit like a cross between Hannibal and MacGyver (my other 80's hero, dreamy :) when I pull off a great "throw it together meal." You know what I am talking about, when 5:00pm rolls around, you don't have any real plans (which I rarely have on Sunday, since I don't do a lot of cooking on Sundays! ), and you start staring at the leftovers. So, tonight was one of those great nights. I pulled out one of my new favorite cookbooks, and with a bit of tweaking to fit what happened to be in my frig at the time, we had a really good dish in 45 minutes. First, and most important in my book, for a really successful meal prep, start with a good glass of wine. 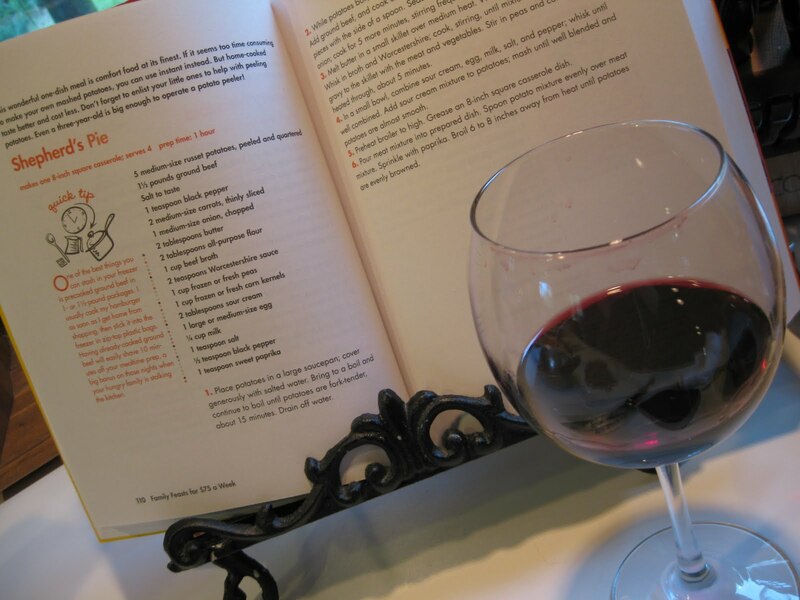 Every cook deserves a good glass of red wine to get those creative juices flowing! A recipe helps, but honestly, I didn't follow the recipe at all, just the concept. 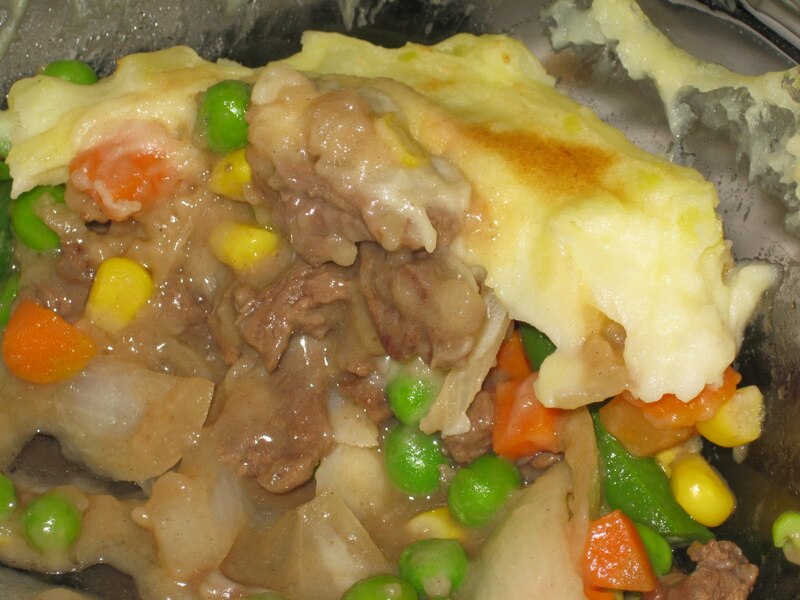 Shepherd's pie, a nice hearty dish - perfect for a family who spent the afternoon putting in the garden. First, preheat the oven to broil. Then, pull out some left over meat. I had two small venison fillets sitting thawed in the refrigerator, leftover from last nights meal. 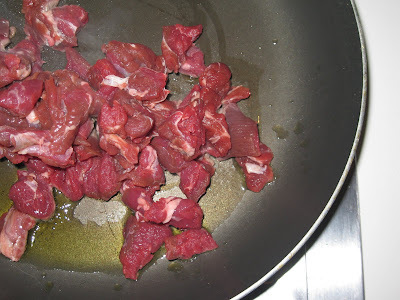 Anything will do - the recipe calls for ground beef, but stew meat, or even chicken would suffice. Right now I am doing anything I can to cook the overstock of venison in my freezer - funny how hunting season lands during the two great fasts of the church. Result - by April I have 2-3 deer's worth of meat waiting to be cooked! So, cut that meat up, and throw it in a pan with a bit of oil. Saute the meat 'till it is cooked through (don't overcook, especially with venison or it will get tough). I added a bit of Worcestershire as it was cooking, and a bit of salt and pepper. 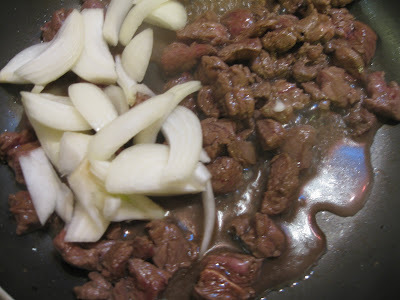 Then, I threw on some onions - already chopped up, again, left over from an earlier meal. 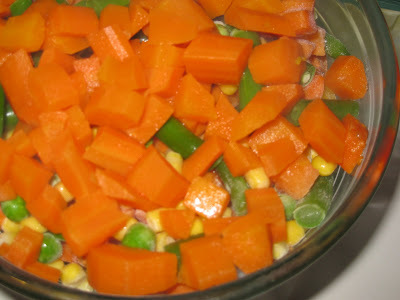 Next, a few veggies - I had peas and carrots left over from dinner last week, and threw in a few frozen ones to add some corn in the mix. Raw veggies would be fine too - I had 3 carrots raw I chopped and steamed in the microwave for 1 minute to soften them. Oh, forgot to mention - before you mess with any meat, put on a nice pot of potatoes to boil - everyone has potatoes in the kitchen, right? Peel, chop, boil with plenty of salt (you can use instant, if you prefer). 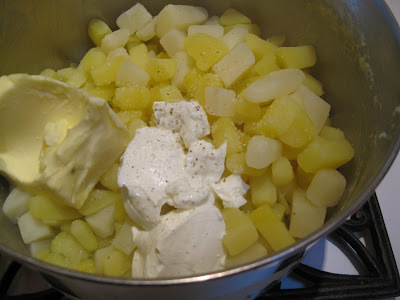 When the potatoes are soft (mine only took 15-20 minutes because I chopped them before cooking), drain, add a nice dollop of butter and sour cream if you have it. A dash of salt and pepper, then mash. Now, back to the meat. Once the meat is cooked, remove it from the pan and place in a casserole dish. Now, add some broth to the drippings left in the pan. The recipe calls for beef broth, but I almost never have that! I had a bit of chicken broth leftover, so I threw that in. Water and bullion cubes, or vegetable broth would work too. Add some flour (a few tablespoons) another dash of Worcestershire, salt, pepper, and stir until you have a nice thick gravy. Be sure to cook for 2-3 minutes to get rid of the flour taste. When the consistency is good, and the taste seems right, dump the gravy into the casserole dish, along with the vegetables. Give it all a good stir, then top with the mashed potatoes. Pop it in the oven for a few minutes, just to brown the top a bit. While you wait, be sure you finish off that glass of wine (if you haven't already :). Pull it out, and serve it up! The only thing I served with it was some bread. The kids cleaned their plates, and this was all that was left to photograph when we finished the meal. You are making me hungry!! !